* At 31 March 2009 there were 201,900 children subject to child support. That has risen to 210,000 in 2010 - approximately one in five under 18s. 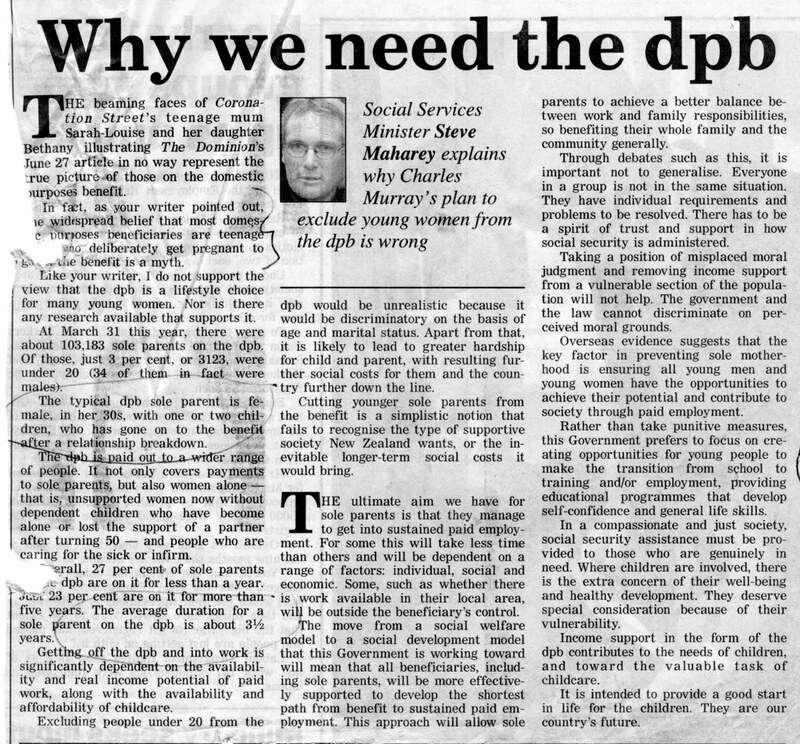 Way back in 2001 I started challenging the Minister of Social Development about the time people were spending on the DPB. 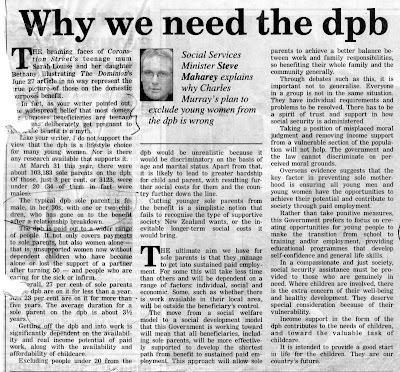 Steve Maharey commonly cited 3 and a half years which was accepted on his authority and became the standard line for DPB proponents. The length of time the average sole parent spends on the domestic purposes benefit could be almost double the official 3.7 years. This is because thousands of sole parents go off, and then back on to, the DPB, but each period drawing the benefit is counted separately rather than cumulatively. 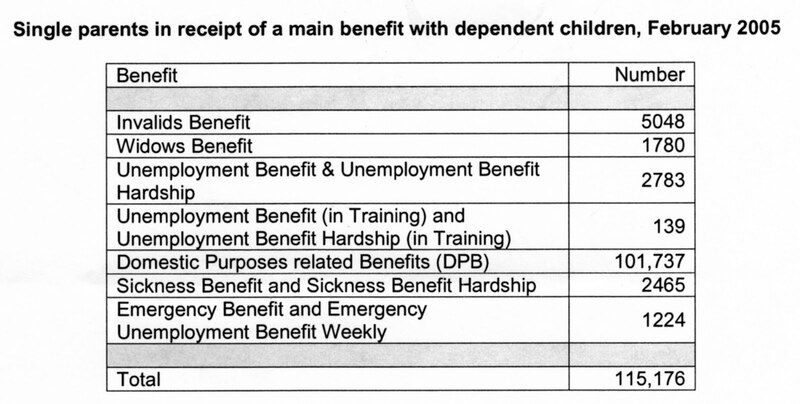 Wellington woman Lindsay Mitchell, who is campaigning for a select committee review of the benefit, calculates from official data that shows how many times sole parents have drawn the DPB that the average real time spent on it is 6.5 years. Mrs Mitchell, of Eastbourne, obtained Social Development Ministry data on how many people currently drawing the DPB had been on it previously. She found that 25,058 of the current 101,000 paid the sole parent DPB had drawn on it once before, 11,493 had drawn it twice, 5043 three times and 3663 for or more times previously. With the help of her husband David, who formerly worked for Statistics New Zealand, she calculated the 6.5 years average from the number of times each sole parent has drawn the DPB. She was critical yesterday of politicians, including Social Services Minister Steve Maharey, as well as the news media, for continuing to repeat the 3.7 years when it was "misleading". 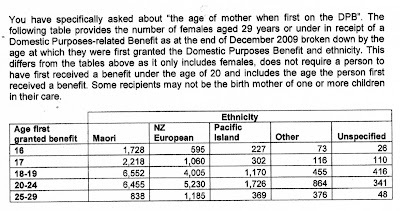 ... when the benefit histories of all New Zealand sole parents receiving benefits at June 2008 are examined, half appear to have become parents before age 23, and the median share of time spent on benefits in the previous 10 years (or a shorter period in the case of younger groups) is 83 percent (mean: 72 percent). The mean time spent on the DPB in the last ten years is 72 percent or 7.2 years. By my crude method I calculated a minimum figure of 65 percent (or 6 and a half years) over a similar period, assuming the data MSD gave me in 2002 extended back to 1993, the limitation of their benefit history at that time. I suppose an apology from Mr Maharey, now Vice Chancellor of Massey University where he is probably continuing to infect young minds with socialist propaganda, would be too much to expect. Is David Ogden morphing into Winston Peters? His campaign promise of 'free' swimming for seniors sounds very nice but must be recognised for what it is. A vote-buyer. And politicians can only ever buy votes with somebody else's money. It's called pork-barrelling. Rife in central government, it is a shame to see it appear so unabashed in local government. Mayor Ogden cloaks his vote-buying with the well-meaning intention of encouraging "healthier and more active lifestyles." Is that where we want local government to go? Using ratepayer's money to nanny them? He says it is time to "invest in the people" . It is the individual's prerogative to decide for themselves what they want to invest their money in. There are probably far more elderly folk worrying about paying their rates than fretting over paying $4-50 for a swim in the local pool. The worst of it is, his only opponent agrees. In fact Ray Wallace will no doubt soon be upping the ante. Those who want lower rates and a focus on core services are faced with choosing between the lesser of two evils. Well done NZ Conservative. They have just linked to a US study that finds non-drinkers have the highest mortality rate. The sample of those who were studied included individuals between ages 55 and 65 who had had any kind of outpatient care in the previous three years. The 1,824 participants were followed for 20 years. One drawback of the sample: a disproportionate number, 63%, were men. Just over 69% of the never-drinkers died during the 20 years, 60% of the heavy drinkers died and only 41% of moderate drinkers died. Oh dear. It looks like "low-risk" drinking is no drinking. Lindsay Mitchell (NZ Herald letters, 15th June) claims that Ministry of Social Development data shows that at last a third of current DPB recipients began on welfare as teenagers. She then goes on to suggest, with no supporting data, that the actual percentage may possibly be twice that. This is designed to make us believe that New Zealand has an enormous problem of sole parents starting young and being on the benefit for years. This Bogey may justify all kinds of draconian knee jerk responses. 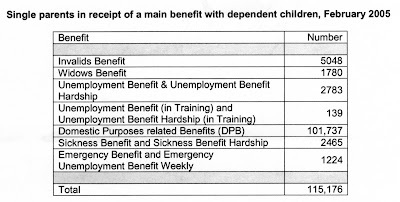 In fact MSD says that, of the 34,000 DPB recipients aged 29 and under who had any time on a benefit as a teenager, only 17% (5,780 people) received the DPB, and the others may have had a minimal stint on unemployment or sickness benefit long before they had children. Thus only 6% of current DPBs started as teenagers. It is a gross exaggeration to describe this as a huge dependency problem. The data clearly shows that sole parents largely move off the benefit when suitable jobs are available and when the needs of their children allow them to. The hand-ringing over sole parents should be replaced with community respect for the difficult lonely and yet vital work they do in caring for their children. 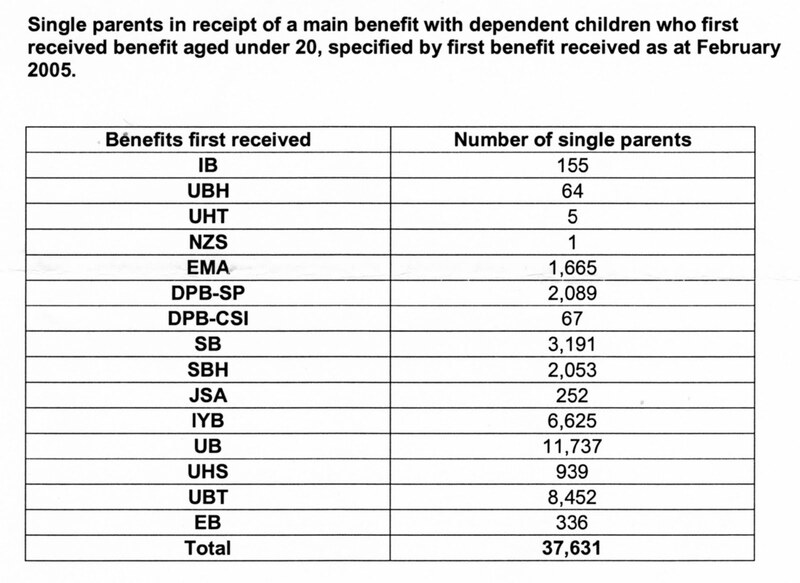 The following is from an OIA request in 2005 and shows that 32.7 percent of single parents currently on a benefit first received welfare under 20. At this time the Ministry could only provide data relating to people aged 32 or younger, so 32.7 percent is a minimum figure. 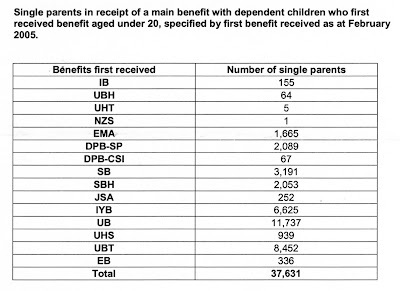 Welfare commentator Lindsay Mitchell said today, "Data released under the Official Information Act shows that of those welfare-dependent single parents the Ministry has full benefit history for (aged 29 or younger) 33,730 first claimed welfare as a teenager, but surprisingly, only 17 percent began on the DPB. For 61 percent, the first benefit they relied on was an unemployment benefit." "This indicates that rather than getting into work or training , many unemployed young people are starting families and moving onto the DPB. Failing to acquire any work experience or further education is virtually a guaranteed pathway to long-term dependency, which is detrimental to both parents and children." 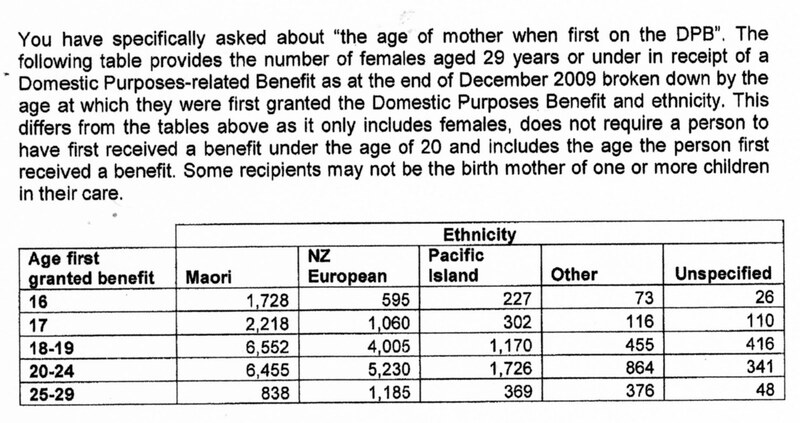 "Over half of these young parents are Maori. Many will have started on welfare during a period of very low unemployment so it is no good blaming the recession or high Maori unemployment. Pacific people experience equally high unemployment rates but they are not over-represented in this group." "In his opening address to parliament the Prime Minister, John Key, talked about moving people off the DPB. But just as important, if not more, is stopping them from going on it in the first place. Especially as teenagers." But what did St John write? "Less than 17 percent of the 34,004 people first received a Domestic-Purposes-related Benefit." By omitting the word "first" she has completely changed what MSD say. She doesn't know whether individuals moved from a different benefit onto the DPB while still teenagers. Next she extrapolates an misinterpreted percentage across all current recipients despite MSD only providing information for those aged 29 or younger (the age will increase as their data expands if they don't lose it all again). St John does not know about those 30 and older who make up 64 percent of the total. "Thus only 6% of current DPBs started as teenagers." • a third appeared to have become parents in their teens. Derived by comparing the birthdate of the sole parent with the birthdates of all the children included with them in periods when they received benefit as a sole parent over the previous 10 years. In the case of older sole parents, this will not be as good as an indicator of early parenting because some first-born children may have already turned 18, or may have left the care of the parent, before the beginning of the 10-year window. "We expect that the proportion of DPB clients who first received any benefit as a teenager is somewhat higher than a third, particularly as receipt of a benefit is such a common experience in people's teenage years." Based on all of the available information I believe that at least half of all sole parents currently on a benefit started on welfare as teenagers. It wouldn't surpise me if the fraction is higher but in the absence of data and the Ministry's seeming reluctance to conduct a sampling survey we will never know. St John is chairing a privately organised Child Poverty conference in October. I was invited to participate but declined. This is because I have come to understand that the pro-welfare lobby will tell lies and discredit those with whom they disagree because they believe the ends justify the means and it is an article of faith for them that government redistribution of wealth is the only solution to child poverty. Celia Lashlie has written another book which I will be reading. My responses to her thoughts are always mixed but she makes me think. In the latest she apparently pushes the idea that the way to end crime is to work with the mothers who raise criminals. This isn't a new idea from her. She is critical of the Government's new push for the faster permanent placement of children, which will leave in its wake, for some, a burning anger and resentment and a pathway to prison. But for others it might be what saves them. Transient fostercare is a sure-fire pathway. Nearly all of the women prisoners, 80 to 90 per cent of them, have been sexually, physically and psychologically abused throughout their lives, and often we - as in society and our state agencies - continue to abuse them when they get out, she says. "I think that's the flash of anger I have," Lashlie says. The media help in abusing them and no one claims any responsibility, she says. "We run this idea that they've had terrible lives and it was someone else's fault, and I've become increasingly angry because it wasn't someone else's fault. "Sometimes it's our bloody state agencies that have done it and how about we stop being quite so sanctimonious." Lashlie is very angry with the way the state and society handle dysfunctional mothers and their children but I can't see how much more liberal society can get. Relative to earlier times, nobody is stigmatised. Nobody is punished. Nobody is left penniless. There are many organisations trying to work alongside families with criminal issues. The Salvation Army, various church and community groups, prisoner rehab groups, Jigsaw, Barnardos, Birthright, Supergrans, etc. The law has recently been changed to allow greater presence of newborns in prisons. I've worked with a few people who fit the bill and I know that they get chances. Often many. Some make the most of those opportunities and others waste them. In the book, Lashlie writes that we can focus on the building of more prisons and sit in our comfortable chairs with a glass of wine lamenting the lack of parenting skills among the lower classes. What we really need to do, she says, is work with the mothers. But I can agree that more people need to step up and offer whatever they can in terms of their time and their own capabilities. The people Lashlie is talking about aren't scary. They aren't a threat to you and me. In fact they are as various as any other people in society. Sometimes highly likeable and sometimes not. Depends whether you hit it off. But a good match can make a difference. And when it does, it's extremely rewarding. In his opinion piece today Matt McCarten slams the "cult of individualism" and blames it for ACT's meltdown. Matt McCarten does not understand what individualism is. But then neither do some in ACT. And, coincidentally, a commentor on this blog earlier in the week. Individualism puts individual rights and personal responsibility over collective rights and collective responsibility. Let's use an example to explain the difference. Raising a child. Individualism would put the responsibility for this with the parents. Collectivism puts it with the largest group - society. Obviously there will be shades between the two positions and a mix of both philosophies co-existing but a true classical liberal party would endeavour to pull the balance in the individual direction. Individualists believe that groupings should be voluntary, not enforced by the state. They reject the use of force as much as it is practically possible. They especially reject the use of state force to penalise some collectives and reward others at its whim. Individualists abhor the idea of class and tribal hierarchy. Individualists will make sacrifices for others but are repulsed by the idea that the collective dictates who those others should be. Individualists believe in the right to live their own lives with a minimum of rules and regulations which should be replaced by tolerance, non-interference with others and mutual respect for that right. Individualists believe that self-interest, when practised peacefully and co-operatively produces the maximum amount of mutual gain. Trade is good. Entrepreneurship is good. Profit is good. Greed is not. Individualism can't be blamed for the impending downfall of ACT (just as collectivism couldn't be blamed for the downfall of the Alliance Party). A party that doesn't even have stated values or philosophy can hardly be the victim of them.